Did someone ride an ostrich through Philly during Eagles celebration? 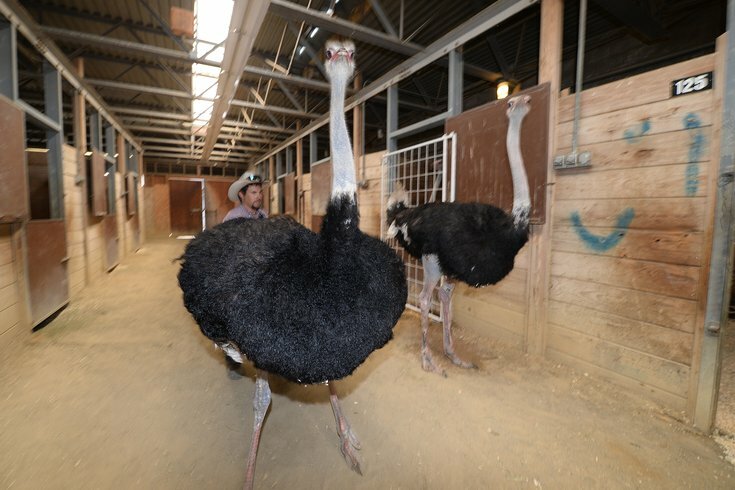 Two ostriches are kept in horse stables at the Meadowlands Racing and Entertainment Racetrack Complex in East Rutherford, NJ. The rumor that someone stole an ostrich from the Philadelphia Zoo and rode it like a horse through Philadelphia appears to have started on Twitter. During the massive celebration after the Eagles won the Super Bowl, some people tuned into Philadelphia police scanner radio to hear the wild stuff being reported. While the celebration was mostly peaceful, some of those things turned out to be true, like smashed windows at the Center City Macy's. But what about the more bizarre rumors, like the alleged ostrich rider? Reading the tweets associated with #phillypolicescanner are both horrifying and hillarious. Stolen police horses, guy stealing an ostrich from the zoo and riding it, a keg party in City Hall, etc. You can't make this stuff up. If you are not following the #phillypolicescanner on Twitter right now, you are missing out at the funniest, most terrifying, depressing and insane things you will ever hear in your life. Highlights include, Macy's being looted, and a man ridding an ostrich stollen from the zoo. Well, we know the mythical ostrich didn't come from the Philadelphia Zoo. The zoo tried to quell the rumors Monday morning with a tweet, noting they don't have any ostriches and all their other birds are safe. Now, for the conspiracy theorists who might counter that maybe the ostrich came from somewhere else: It would be truly incredible for someone to ride an ostrich through the streets of Philadelphia during likely the biggest celebration in the city's history and not a single person recorded it on their cellphone. If there's a photo or video, please send it to me, because I haven't seen it. It just didn't happen in Philly Sunday night.